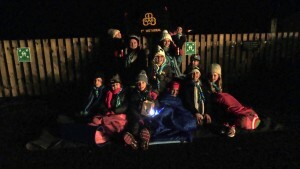 A troop of Brownies will be wrapping up warm and spending a night under the stars to help raise money to keep older people warm this winter. The Big Sleep, organised by Cumbria Community Foundation, raises money for the Winter Warmth Appeal – a pot of cash distributed across the county to help older people suffering from rising fuel costs and poor health. People are sponsored to sleep outside for the night and discover what it’s really like to suffer from the cold. It’s the third time the Brownies have taken on the challenge but the first that they will have ventured out of their village for the sleepover. 1st Wetheral Brownies spent their first Big Sleep in a tent in a garden, the second in the auspicious surroundings of Wetheral Priory and now will be joining hundreds of others beside Lake Windermere on Saturday 28 January. Ten Brownies aged between 9 and 11, three young leaders and three adults are preparing for their big adventure with each aiming to raise £20. They are also planning to set up a JustGiving page so the little sleepers can be sponsored by those who can’t bear the cold and sleep out. The Brownies have raised more than £1,300 for the Winter Warmth Appeal by holding their own Big Sleep for the last two years. Helping local, older people stay warm in winter is a cause the girls really care about. The Big Sleep is held in front of the Low Wood Bay Hotel, Windermere. To find out more or to enter visit www.cumbriafoundation.org/bigsleep/enter. You can also simply send a text message to 70070 including our code WINT37. You can donate £2, £5 or £10. e.g. WINT37 £5 to 70070.